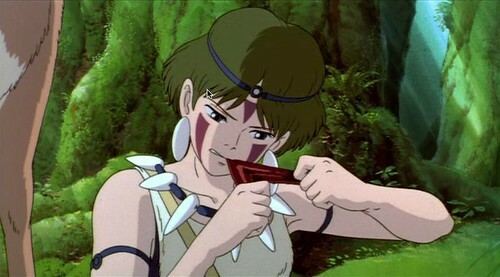 After our “Ghibli feast #1: Porco Rosso,” we moved onto a more serious if not the most serious Ghibli film, Princess Mononoke. 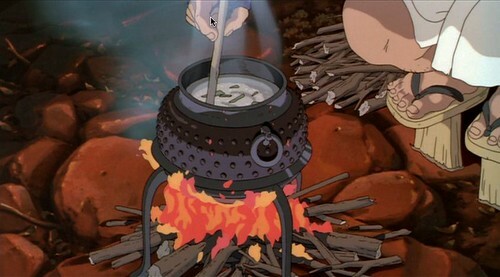 Our second Ghibli feast was Princess Mononoke. 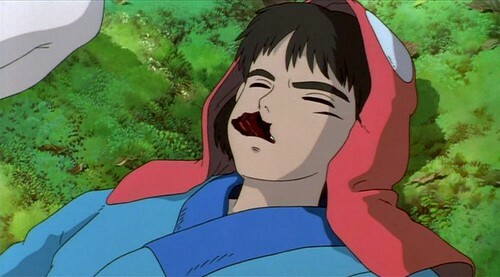 Princess Mononoke is very different from any other Miyazaki film. 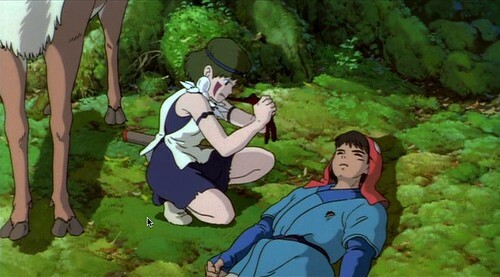 Some scenes are very graphic and violent.Â The main characters, San and Ashitaka, aren’t exactly energetic care-free characters, like typical characters from Miyazaki films. Ashitaka gets cursed for killing a god when trying to save his people, and San hates humans and lives in the woods with wolves protecting the forest. There’s a very strong message in this film from the both sides, the ones who destroy the forest to survive, and the ones who protect the forest. There’s some food here and there, but personally I didn’t really recall any special food. 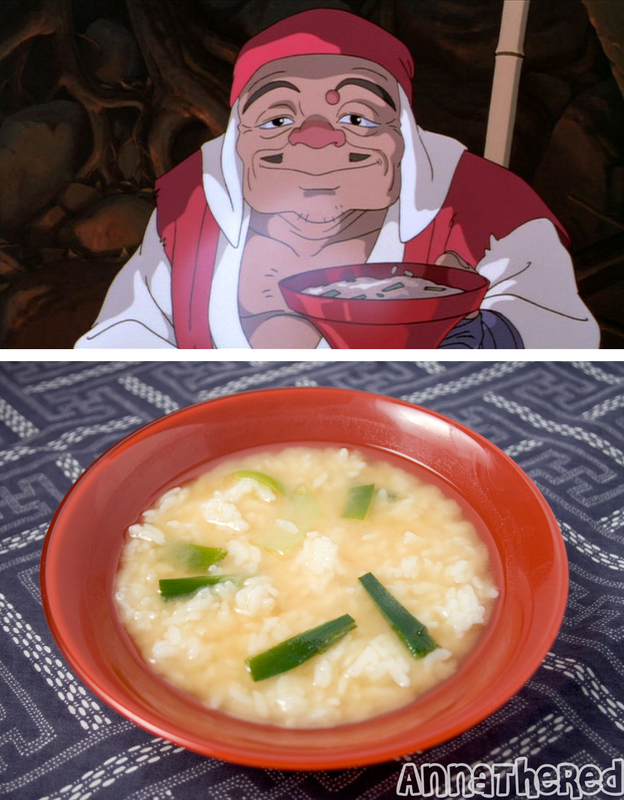 My boyfriend mentioned a couple foods he always wanted to try from the film, and one of them was the rice porridge. Ashitaka meets the old man with a red hat while trying to buy rice in the village. The rice sellers refuses to trade rice with Ashitaka’s gold, and then the old man shows up and convinces her to sell him rice. 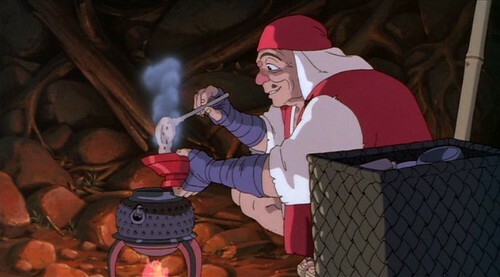 Later, the old man makes rice porridge with the rice Ashitaka bought. Again there’s no list of ingredients, so we had to guess what’s in it. 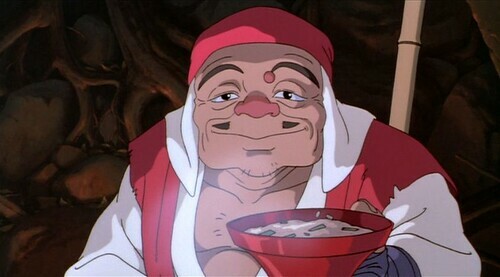 I could see that he’s putting miso in, and you can also see some green stuff in the porridge. Scallions or leeks are very common ingredients for miso soup, but you usually slice scallions for soup, so I decided to use leeks. I boiled water, put some miso in, then cut leeks in the same shape as the one in the film, and put it into miso soup. Well, okay, so it wasn’t really “porridge”… I basically put rice in miso soup. 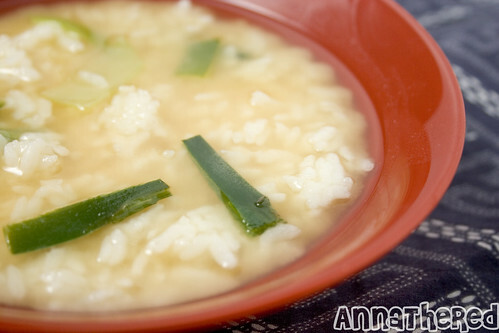 Rice porridge isn't only great for when you're sick, but it's also a common food to eat to end a night out. I guess it's kind of like pizza in the U.S. Simple but it sure fills you up. Also it's very easy on your stomach. Our miso was a lot lighter in color. Also their rice probably was mostly oats, but the red bowl helped a lot. 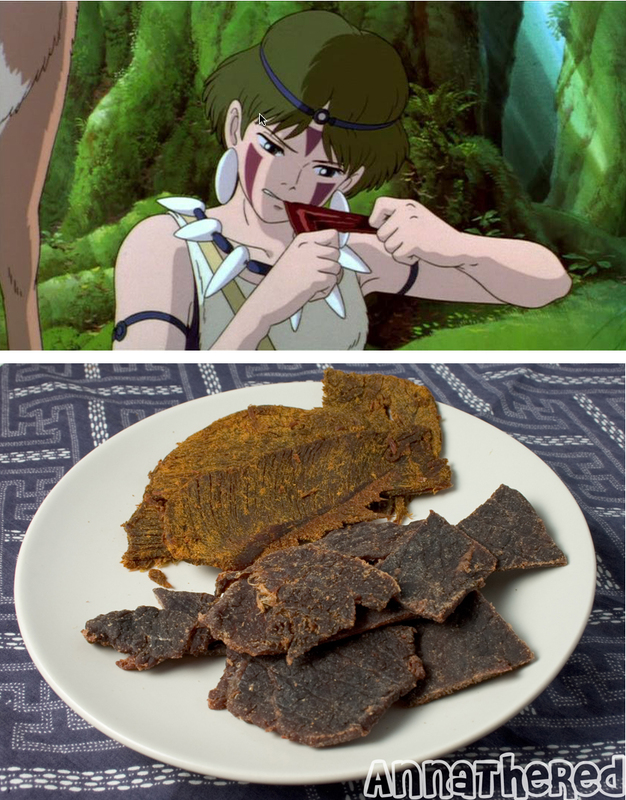 My boyfriend was telling me that the scene where San feeds Ashitaka jerky looks really good, and he wondered what it would taste like. I searched some Japanese sites, and found a lot of people who also wondered the same thing. Some people thought it could be tree bark because it sounds like it’s very hard when she bites it. But we decided to go with something more ordinary and got beef jerky. We got two kinds of beef jerky. Unfortunately, it's all cut up so it's easier to eat. We don't usually eat beef jerky, but it was kind of fun biting and tearing dried meat. It made us feel very wild. As you can see, we didn’t prepare too much for this film, but preparing for Porco Rosso took a lot longer than we expected, so it balanced it out. You can also see these pictures in Ghibi feast set on my flickr page! As I wrote in my post, it’s not exactly rice porridge. I didn’t have rice cooked for porridge, so basically it’s rice in miso soup! But it still tastes good. I used to eat my rice like that when I was little. 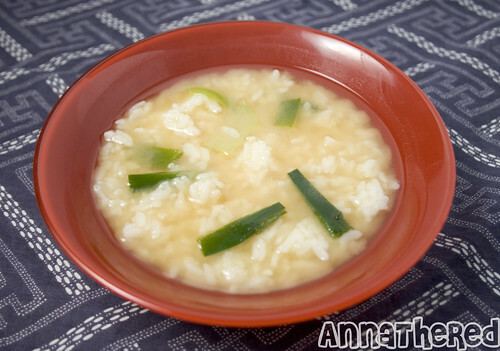 The rice porridge looks really good after I saw the picture of your cooking.. I’ve seen Korean mix rice with their soup too, just like this. Maybe I’ll try it next time LOL. Chazuke is more like “green tea + seasoning” (“cha” means “tea”), and this is more like rice porridge with miso. I’ve seen fish cake with cute characters drawn on them, but I’ve never tried making fish cake on my own. I’m too lazy to do it. Are you sure it’s Jerky? I always assumed for some reason that what they were chewing on was some sort of bark or plant-like thing, for medicinal purposes. Hi. Beef jerky really doesnt taste good! 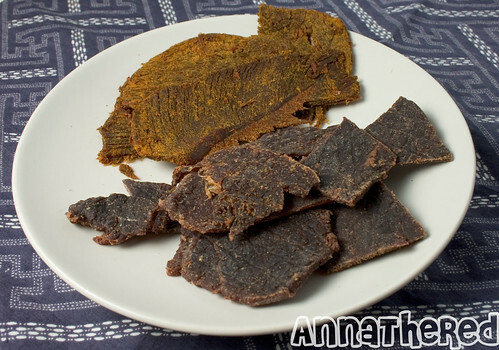 Google ‘biltong’ its our south african version of preserved meat. 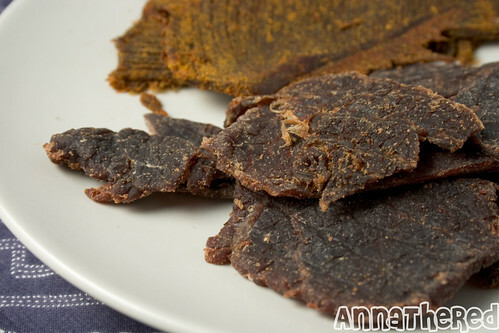 It could be beef, but we also make it from ostrich meat (slighty saltier) or game or venison. Its basically strips of meat that you soak overnight in a mix of sgar, vinegar, salt, pepper and corriander seeds (crushed). Then the following morning you hang the meat anywhere where it can dry (and drip) in a hot room with good ventilation! Much much better than jerky! Closed caption says the jerky is bat btw love that you’ve done this! By miso, do you mean daiso stock? I meant to type Dashi stock. Sorry. Red Coffee Machine - Hiya, guys. Today is my Birthday! Friends, inquire within?